Melvin Gordon has been a touchdown machine so far this season. He’s the only guy within striking distance of Todd Gurley in fantasy scoring among non-quarterbacks, and it’s thanks to his ability to tally touchdowns. After not scoring in week 1, Gordon has scored at least once in each game since, including two three-touchdown efforts. He’s producing on the ground and through the air, and is by far the second-best non-quarterback available in fantasy football. Gordon was a major bust in his rookie season, but in the last few years, he’s shown his worth as a three-down running back in fantasy football. He’s an easy start, so for the rest of the questionable starts/sits, here’s the week 7 fantasy football start ’em, sit ’em guide for running backs. It’s another tough trip for the Broncos with a Thursday night matchup against the underwhelming Cardinals. Unlike previous weeks, I anticipate the running game to work better for the Broncos against an Arizona team not capable of stopping the run. The Cardinals allowed Latavius Murray to explode on them in week 6. That takes an incredible amount of awfulness. The Cardinals are giving up the most fantasy points per game to running backs this season. Teams are averaging 5.1 yards per carry in the last three games against the Cardinals, ranking 28th in the NFL. Lindsay continues to out-touch teammate Royce Freeman in the backfield, especially in the passing department. Freeman should get some looks this week against the Cardinals, but I still favor Lindsay, based on his ability to catch the ball out of the backfield. Look for the Broncos to establish a running game, giving Lindsay solid value. I know teammate Frank Gore outgained Drake in week 6, with a major outburst against a once seemingly invincible Chicago Bears defense. However, I was actually a little more impressed with Drake. He looked sharp and still out-touched Gore, albeit by just one. Drake was utilized in the passing game and was still trusted in the overtime period after fumbling at the goalline earlier in the period. Gore’s yardage total was artificially lifted thanks to Chicago getting completely gassed in the fourth quarter and overtime on the defensive side of the ball. The Bears couldn’t stop any running back at that moment, helping Gore get to his final totals. Drake was better through most of the game and I anticipate his share of work will continue to increase, and that’s a good sign against Detroit. The Lions are giving up the fourth-most fantasy points per game to running backs, so even with a little less work than normal RB1’s, I’m still forging ahead with Drake. It hasn’t been an easy year for McCoy or the Bills, but there’s hope in week 7 against a Colts team that may feature the worst roster in the NFL. In reality, this game is probably a battle between the worst two rosters in the NFL. So that should at least help McCoy, since even though he’s not the same player we witnessed years ago, he’s probably one of a handful of players that are legitimate NFL players on this field. McCoy looked good in week 6 against Houston and has been a bright spot for the Bills in the last two weeks. He’s basically the only weapon available for the Bills, so that volume should increase his value in week 7. The Colts give up the 14th-most fantasy points per game to running backs, and with how much McCoy is needed by the Bills, this should be a spot where McCoy should at least be an RB2. There’s just too much uncertainty surrounding Crowell. He was unbelievable in week 5 and came crashing back to earth in week 6. That’s similar to his yardage output in weeks 2 through 4, after rushing for more than 100 yards in week 1. With that up-and-down season, and competition from teammate Bilal Powell, he’s not worth a start against the Vikings. Minnesota’s rush defense has generally been pretty good this season, allowing a little more than 14 fantasy points per game to running backs, ranking eighth in the NFL. Minnesota looks strong up front against the run, so it’s not likely Crowell will have much room to run. The Dallas front is one of the better units in the NFL. That will be an issue for a Redskins team that has one of the oddest offenses in the NFL. Washington basically only scores and moves the ball in the first half of football games. Since Washington has had a bye week, we have five games of evidence. In those five games, the Redskins have scored 106 points. Only 24 of those points have come in the second half. And oftentimes, it’s because the rushing game can’t punch it into the endzone. You can’t depend on the Redskins to jump out to leads every week, so I’m dismissing Peterson’s influence, based on what I believe will be a negative game flow. Peterson doesn’t add anything in the passing game and the Dallas defense is giving up the sixth-fewest fantasy points per game to running backs. Don’t trust the Redskins in this one and that offensive structure will need to evolve if the Redskins will be taken seriously. His usage is scaring me and this matchup doesn’t work. Miller shared some time with Alfred Blue in week 6. And now D’Onta Freeman is returning to a Texans team in need of some offensive consistency. Miller’s usage has always been noteworthy. However, his production just hasn’t been enough in Houston. He hasn’t gone for more than 50 yards rushing since week 2, and against Jacksonville, that doesn’t seem likely. 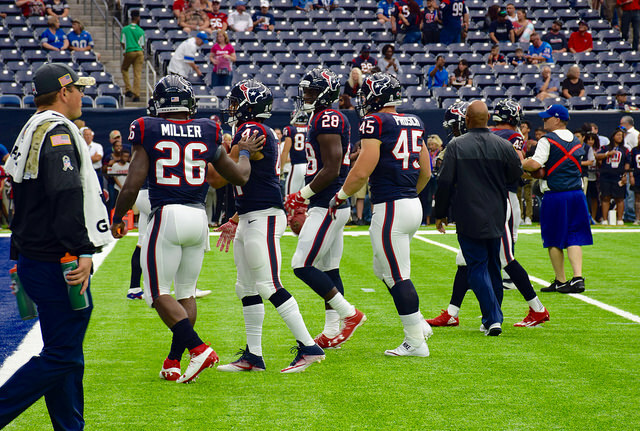 The offensive line is horrendous in Houston and it’s not getting any better. Jacksonville didn’t look good in week 6, but don’t let that cloud your judgment on this overall defense. They can still stop the run and are allowing the eighth-fewest fantasy points per game to running backs. There are other high-producing running backs available in week 7.